We’ve had the opportunity to spend quite a bit of time with our top small business partners over the summer as they hold meet & greets / lunch & learns while kids are out of school and staff takes vacations. We got to see firsthand how the features and the problems are both the same as they have always been (budget, buy-in) and completely different in a way that technology solves business problems – cloud compliance, vendor/mobility management. One of the businesses that moved to ExchangeDefender was able to get rid of 7 (seven!!) different vendors involved in email & mobility solutions alone. ExchangeDefender is increasingly becoming the modular security solution that can help service your mobile & security needs end to end. From email hosting to support for everything that entails, from managing mobile devices to assuring their compliance, archiving, business continuity and data management – ExchangeDefender does it all from a single pane of glass. All you have to do is change the way you tell the story. Typically, small business partners follow the same “vendor” approach to positioning ExchangeDefender “we kill SPAM for a living” and then mention the other nice “bonus” features we offer. While that may work on larger companies with CIOs where a point solution is necessary (or required for redundancy), in small business you need more finesse as you introduce our solution as the Swiss knife for typical SMB problems. 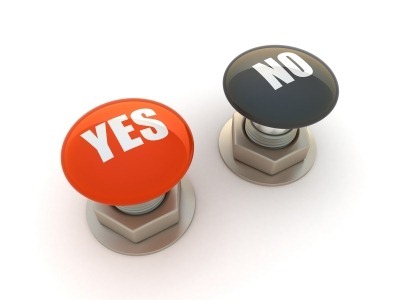 Small business decision makers typically aren’t that interested in technology specs, even if they are familiar with the problems, they are looking at the price and at the time this the solution is going to take away. We position ExchangeDefender as a service (not even mentioning the cloud) that takes care of keeping junk out of the mailbox, keeping people productive and safe, making sure any outages have a workaround and as needed we also do encryption to protect data automatically and compliance archiving to help meet regulatory requirements and keep fines away – and we build, manage and support 100% of it end to end. In a way, we’re the last security product you need to look at and the only one you need to contact when there is a problem. In a way, our go to market has been the same as it’s always been – but with the cloud you’re dealing with small businesses with data all over the place and providing security to a mobile organization with decentralized storage is no longer a “security” pitch, it’s a management pitch that gives them back their time. ExchangeDefender introduces email delivery service for IoT, devices, printers and services. 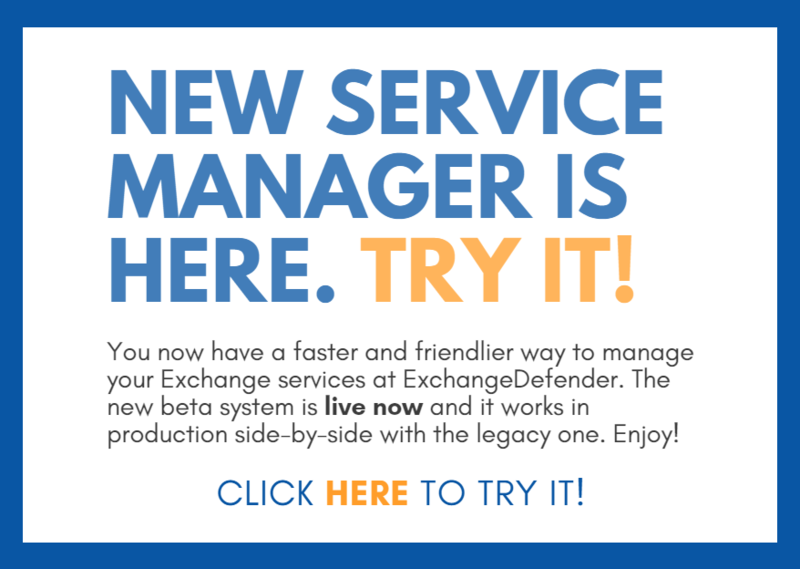 ExchangeDefender (Beta) production is really picking up steam with the modern codebase and we wanted to launch a line of solutions to problems that have either been a challenge over the years or are expected to become a management issue going forward. One such area is the subject of service accounts that are only used by devices, printers, CRM solutions and notification services. We now have a separate system designed to allow SMTP-notification devices and services to relay through the ExchangeDefender network. Quick rewind: Long, long ago during the great SMTP vs. UUCP dark ages, message exchange was trusted and trivial. But once it started getting abused by spammers and hackers, each ISP decided to implement their own flavor of SMTP traffic restrictions and regulations to curb the abuse. 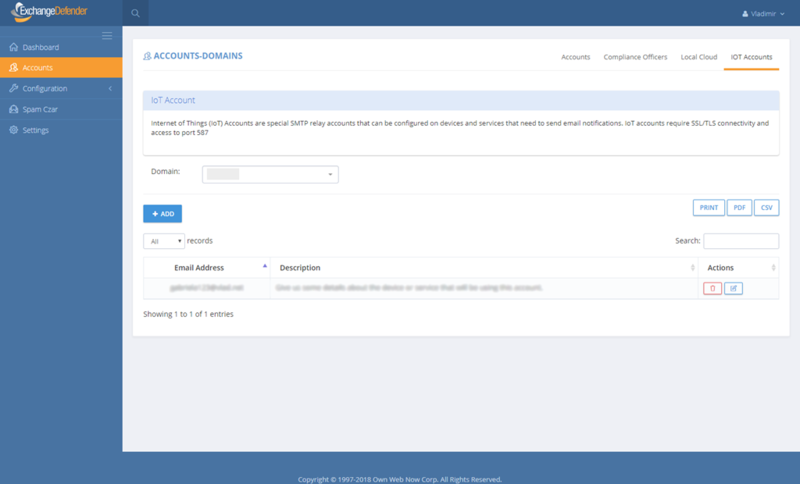 It became exceedingly difficult to relay mail from a consumer and business-level broadband connection but as more services and devices come online they defaulted to the standard SMTP protocol to send notifications and messages. Unfortunately, because ISPs still have their policies that are constantly shifting, trusted third party SMTP solution is needed but managing it is not something that is viable as a business model.. yet. 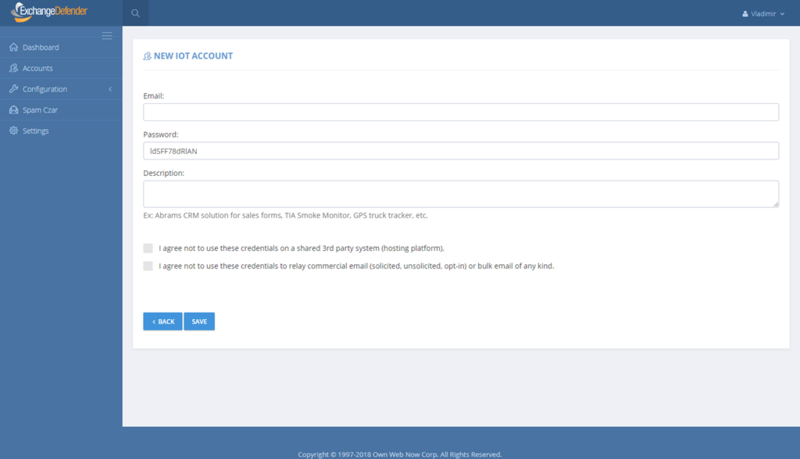 Just add a new account and you will be prompted for some basic information such as email address and description of the device/service used. You will notice some important warnings/restrictions about this service (No, you can’t be a spammer or use this in a shared environment where it can be hacked) and that’s literally all you need to get started. It’s really just that simple. Best part? No management, licensing or tools to set up: just the ExchangeDefender SMTP relay network. This feature is supported (even though it’s beta) and it’s free! We hope you enjoy this and would welcome suggestions about which features you’d like to see in ExchangeDefender now that you have a better idea of where we’re going with the development of our messaging platform. We’re obviously going to tweak these services as we get a better idea how they are used and how much management they require on our end. Come celebrate St. Patrick’s Day with our promotion going on, starting March 17th and ending April 17th. We are offering $3.00 off Full Hosted Exchange with an order of 5 mailboxes or more. Just use the code: XDLUCKY16 when ordering your mailboxes. If you have any questions or concerns please feel free emailing us at partners@exchangedefender.com or calling us at (877) 546-0316. Thanks ConnectWise IT Nation 2012! Thank you to everyone that stopped by our ExchangeDefender booth at ConnectWise IT Nation 2012!! As usual, ConnectWise put on a great event at a beautiful venue with tons of valuable content and social interactions in an atmosphere conducive to learn and further build upon business relationships. We had a lot of great conversations with some of our existing partners and also meet some potential new partners. 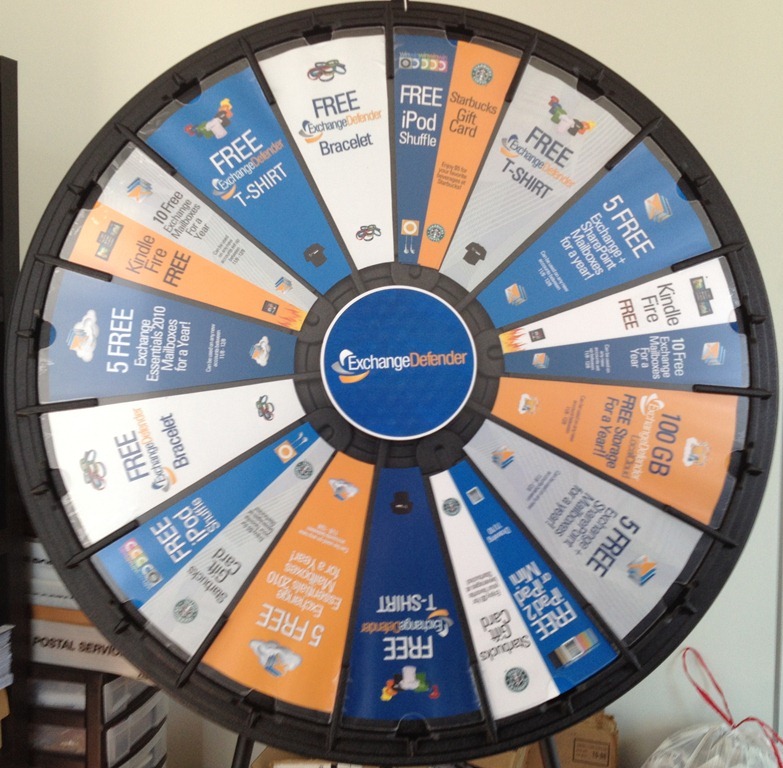 At our booth this year we decided to have a Spin-to-Win wheel and it was a huge success!! 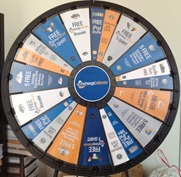 We gave away a ton of our services for FREE exclusively to those who gave the wheel a spin and landed on those offerings. In addition to the offers, we also had some big prize winners! See our ExchangeDefender Facebook page for more pictures! We had a great event, and we look forward to ConnectWise IT Nation 2013! If you want to boost your sales figures or just increase the number of clients you have, here is a quick marketing tip for you to remember: “People buy for their reasons, not yours!”. Many small business owners make the mistake of selling their services, based on what THEY think matters. In other words, they look at their products or services and because they know it so well, they assume they ALSO know why each individual prospective client would want to buy it! That is the wrong thought process when it comes to maximizing your marketing efforts and sales profits! Focus on Buying Motives!!! Maybe you noticed but in the last paragraph I used the word ‘individual’? This is mainly because people have their own, individual motivations for making a purchasing decision. In marketing and sales it is called a buying motive. If you try to sell or market your service to someone based on what you assume will be of most importance to them, you will most likely lose their interest. However, if you take a moment to discover what matters to your prospective client base, you will know exactly what to focus on. Discovering the buying motives of your clients and then focusing on what they need will not only increase their interest but also can increase your return rate tenfold! · What would I be using the phone for? · What features and capabilities I wanted? · Who was my provider? · Do I have a contract? · What my budget was? After giving him my answers, he was able to point me in the direction of a small selection of phones that did exactly what I was looking for. Then, by answering my questions, we were able to spot a clear winner. The sale was a success because he discovered my buying motives and focused everything on getting me a phone that fit my needs. I got a great phone and he made an easy sale! When you look for what a client needs it turns into a win-win situation! Also, discovering someone’s buying motives always allows you to provide better service to them. With this example above, at no point did I even feel like I was being sold to. It felt like he was using his knowledge to advise and direct me rather than sell, so that I could make the right decision based what I needed. You can apply this idea to the IT world as well to better cater to the needs of your clients. Many products and services that you have in your solution sets will help clients to fix pain points that they have and you just also need to ask the right questions and offer them the services that they are looking for and see a need for in their businesses. Upon speaking with a prospective client or customer for the first time, always make sure that your primary focus is to establish what is most important to them and what they are looking for. If you get it right, people will never feel like you are selling to them, but rather providing them with what they need or fixing a pain point for them. You will also come across as a professional who is helping them make the best decision possible, based on their needs – not yours! Sign up for the Webinar NOW!!! How does ExchangeDefender compare to others in the industry? Check it out for yourself here! ExchangeDefender is an Internet-based message hygiene and business continuity network that can secure and save your business by providing AntiSPAM and Antivirus protection, Web File Sharing, Web Filtering, LiveArchive, Encryption, Archiving and Compliance, Reporting, and so much more. ExchangeDefender is a complete mail solution, and nothing reinforces that statement more than LiveArchive. For the ultimate peace of mind, LiveArchive provides always-on, real-time, secure web access to your email when your mail server is down, disconnected or undergoing maintenance – all without sacrificing your corporate identity. The best part of about LiveArchive is that it is included in the price of ExchangeDefender. So, you receive the protection and reliability of LiveArchive without the additional cost. ExchangeDefender is completely partner-centric and works hand in hand with our partners to not only provide hosted solutions but to maintain a successful partnership. Together with the world-class support and product offerings and features for the cost, ExchangeDefender is a head above the rest! All of our products and services come all-inclusive and backed by our 24x7x365 Technical Support. All of these features and support come without any software to install or maintain. Keep your mail server running as it is and deploy ExchangeDefender in less than 5 minutes at the fraction of the cost of other antivirus licensing alone. ExchangeDefender has so many wonderful benefits and features, if you are interested in knowing more or have any questions, please let us know! How do we measure up for you? – Let us know! *Attention!!! There are only 2 more days left of our Valentine’s Day promotion! You don’t want to miss the chance to get a great pricing discount on our best full featured offerings. Take advantage of this offer for our Hosted Exchange solutions for one flat, all-inclusive rate per mailbox per month. You can offer your clients a hosted messaging solution that is flexible enough for their varying needs today and tomorrow, and robust enough to enable you to turn a profit on every mailbox every month. With Hosted Exchange 2010 + SharePoint 2010 from ExchangeDefender, data is stored on our globally-redundant infrastructure and accessible via Outlook Web Apps, Outlook desktop client, and mobile devices. Hosted Exchange 2010 + SharePoint 2010 from ExchangeDefender is protected by the world-class ExchangeDefender security suite, so in addition to being reliable, messages will be free of malicious code and safe for consumption anytime, anywhere, and also comes with the LiveArchive service built right in. Hosted Exchange Essentials is a budget-friendly security solution that covers the basic needs of many small businesses. Whatever your clients’ needs are, you can get your foot in the door and start or continue building a strong relationship with the powerful combination of Hosted solutions and ExchangeDefender. Now you can offer your clients an attractive combination of rich features, affordability, security and flexibility on our globally-redundant infrastructure that even most large enterprises cannot build in-house. Be sure to use the coupon codes that are associated with the offers to receive the promotional pricing. Stay tuned to your mailboxes and also our ExchangeDefender Promotions page, www.exchangedefender.com/promotions.php to always be on top of all of the great offerings available to you! Can you choose your customers??? Yes, you can choose them, not always the other way around. You can choose your customers with your pricing, your content, your promotion, your marketing strategies, and your product line. Based on what you are offering, how much does this type of customer need you/depend on you? How difficult is this sort of customer to find/reach? What does this type of customer need? How valuable is a customer like this? How demanding will this customer be? It’s not a matter of who can benefit from what you sell. It’s about choosing the customers you’d like to have and helping them benefit from what you have to offer. By asking yourself these questions you can better attract the types of customers that you would like to work with. At ExchangeDefender, our efforts have brought us a partner base that we truly enjoy working with! All of our partners know what to expect from the partnership upon their signup. We clearly state and outline what they get as part of partnering with ExchangeDefender. Our terms of service, TOS, outlines the way that our technical support and business support works, and the best way to get assistance when it is needed. Also, all of our products and services are heavily promoted, documented, and made available for partners to have access to and we provide materials which make it easier for you to be profitable. Also, we make it easy for customers to choose us. We work closely with partners and are available for help and questions 24x7x365! 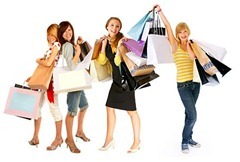 Also we offer great deals and promotions that help our partner base benefit! Check out www.exchangedefender.com/promotions.php to keep up with promotions that we are running! Currently we are running the Valentine’s Day Hosted Exchange and Exchange Essentials Promotion! Happy Valentine’s Day to everyone from ExchangeDefender!!! Everyone check your mailbox! We love our partners and we want to give you all a special promotion for this Valentine’s Day! We are running an Exchange promotion! 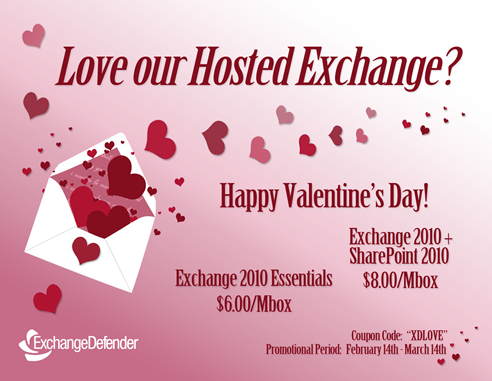 For a limited time, we are offering Hosted Exchange 2010 and SharePoint 2010 for $8.00/mailbox and Hosted Exchange Essentials 2010 for $6.00/mailbox. The promotion will run from February 14th – March 14th and be valid on any and all new accounts that are signed up during the promotional period when using the coupon code given. Check your mailbox for a postcard or go to www.exchangedefender.com/promotions.php for more information and to get the coupon code.